You might know that I'm mildly obsessed with my Hamilton Beach Sandwich Maker . I reviewed it, I wrote recipes for it, and I gave a bunch of them away. It's fun to use, doesn't take a lot of space, and it's easy to clean. It doesn't heat up the kitchen. I don't need to use the stove. It's completely non-essential, but I use it often. Just because it's fun. So, when I found out there was a cookbook dedicated to making things in a sandwich maker, I said, "Sure, I can review that." I don't think the brand is mentioned in the book, but are there others out there? I really don't know. I'm perfectly happy with the one I have. 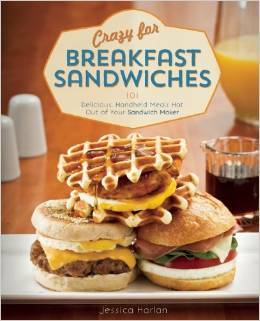 The book is called Crazy for Breakfast Sandwiches , and the author is Jessica Harlan. It's a thin volume, with no interior photos - but they're probably not necessary. These are sandwiches... it's not waffle surgery. 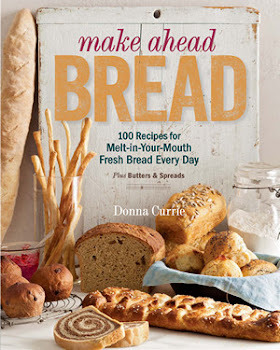 Although some of the recipes in this book are pretty basic - available at the drive-through of the closest fast food chain - there are others that are a heck of a lot more creative. I mean, would you think of using your breakfast sandwich maker to create shrimp and grits stack, or a Chicago-style hot dog, or a French toast stack with praline bacon? Probably not. But now that I think if it ... hmmm. Ideas sprout. Let's face it, if you just got one of these sandwich makers, maybe you need some lessons in the basics, like where to put the egg, what order to layer things for the optimum melting without burning, and how long to cook your monstrosity. There are also recipes for components you might use, like biscuits or pancakes. Of course, you can also by pre-made components and assemble them. But it's good to have options. I felt compelled to cook something from the book, so I browsed for a recipe where I happened to have everything on hand, and ended up with a ham and cheese sandwich with butter, mustard, ham, cheese, and pickle. I used a burger bun, since I made those a few days ago and I had some left. Otherwise I followed the recipe, even though I was itching to ditch the pickle and add a sliced tomato and a smear of mayo. It was a good sandwich, and a fine lunch. Did I need a book to tell me how to make a sandwich? Not really. But it inspired me to make a ham sandwich that was different from my usual fare. And that's always good. Nice to cook outside the loaf pan. Meanwhile, if you've got a breakfast sandwich maker and you haven't ventured beyond sausage-egg-and-cheese, you might want to pick this one up. It would also be a great add-in if you're giving a breakfast sandwich maker as a gift, so the recipient can see the possibilities beyond breakfast. I received the book from the publisher at no cost.